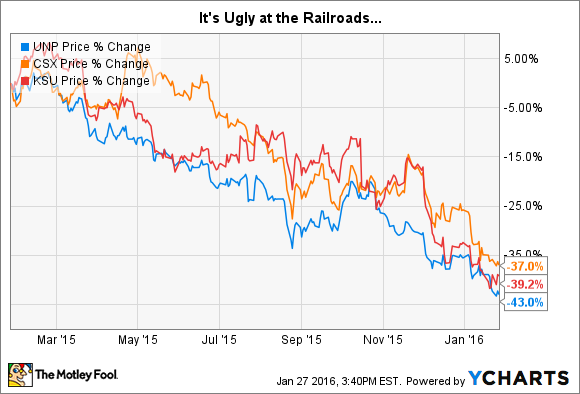 Will 2016 Be Union Pacific's Best Year Yet? Probably Not. Union Pacific is facing stiff industry headwinds, which will probably turn 2016 into a less than stellar year for this railroad. Last year wasn't really a great one for Union Pacific Corporation (NYSE:UNP), one of the largest railroads in the United States. If you're looking at that weak showing and wondering if 2016 will be one of its best years yet as the railroad turns things around, the answer is most likely no. Here's why. Union Pacific logo. Source: Union Pacific. Union Pacific is one of just a few major players in the domestic railroad space. That puts it, like peers CSX Corp. (NASDAQ:CSX) and Kansas City Southern (NYSE:KSU), at the heart of U.S. commerce. These companies move cargo of all sorts from where it gets made (or enters the United States) to where it's needed. Although falling oil prices do make shipping by truck more competitive, trains are still among the cheapest alternatives around. It's a great business in many ways, particularly since the industry is basically an oligopoly. But railroads don't control the economy. Thus, the amount of stuff they transport, and how much they can charge, waxes and wanes with customer demand. And that was a problem for Union Pacific throughout 2015. For example, five of the six product segments that Union Pacific breaks out saw declining carloads last year. The only product category that saw increased carloads was automotive, and it wasn't nearly enough to offset the negatives. For the year, the company saw a 9% decline in carloads. However, that's not the only negative. The average revenue it earned per carload was down in every product category, even automotive. So even where it was able to ship more, it made less per item shipped. That's a pretty lousy backdrop as the railroad enters the new year. If this were just Union Pacific, you might believe that management could turn things around with a little elbow grease. But this weakness was across the board at the railroad. For example, CSX saw a similar trend, with eight of the 11 shipping categories it breaks out posting year-over-year declines. And of the three that managed to stay in positive territory, volume growth slowed in two. Only Automotive stood out throughout the year. And, like Union Pacific, revenues per unit moved were lower across the board, too. Even Kansas City Southern, which had more pockets of strength, saw carloads drop 3% overall. And, like its peers, it wasn't able to generate as much revenue per carload, with that metric declining 4% year over year. This is widespread weakness, to be sure. But that was yesterday. What about tomorrow? Well, Don't expect an improvement. Union Pacific CEO Lance Fritz noted in the fourth quarter release, "Overall economic conditions, uncertainty in the energy markets, commodity prices, and the strength of the U.S. dollar will continue to have a major impact on our business this year." Those thoughts were echoed at CSX, where the company explained that the "impact of continued low commodity prices, strong U.S. dollar, and energy market transition is expected to further challenge 2016 performance." Kansas City Southern CEO Dave Starling was more cryptic, explaining on his company's fourth-quarter conference call: "We do not have a crystal ball to help project how the industrial economy will perform over the next six to 12 months. For that reason, we're unable to project definite growth and revenue numbers for the near future." Of course, he also noted that the headwinds of 2015 appear to be spilling over the 2016, which helps explain his reluctance to offer guidance. This news is pretty consistent across the entire industry. So the same headwinds that buffeted the railways last year are likely to prevail again in 2016 -- and take earnings down with them. Unless something changes for the better on the economic front, Union Pacific's 2016 is definitely not going to be its best year yet. That doesn't make the railroad a bad company, but it does help explain why investors are so sour on the shares right now.